First, we should do something economists need to do more often – apologise for making bad predictions. 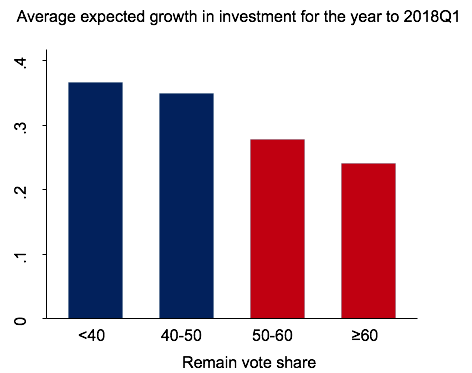 In advance of the June 2016 referendum on Brexit, one of us in particular – Nicholas Bloom – predicted a collapse in investment and growth. Thankfully, so far this has yet to happen. 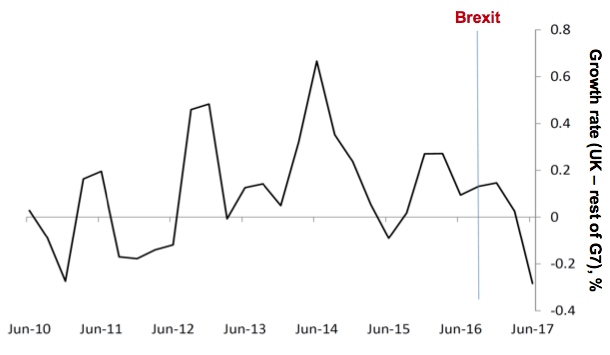 Yes, Brexit had lowered growth - UK growth rates are now falling and about 0.5% lower versus trend compared to Europe and the US (see Figure 1). But there has not been the catastrophic growth collapse we feared (e.g. Dhingra et al. 2016) – at least not yet. But what now – is the Brexit collapse about to happen, or will economic growth remain lower but not disastrous, or maybe growth will now accelerate as some Brexit supporters claim? A year on we are in better shape to assess the evidence. In collaboration with the Bank of England, we have worked to set up a new Decision Maker Panel survey1 of about 2,500 UK firms (Bloom et al. 2017). Each month we ask panel members made of CFOs and CEOs from a broad range of UK companies about their current business conditions. We ask for their data on past growth, current levels, and possible future changes (with the probabilities they ascribe to each) in three areas: investment and borrowing; employment and costs; and sales and prices. We also have a few one-off questions on the possible impact of Brexit on business conditions. 1. 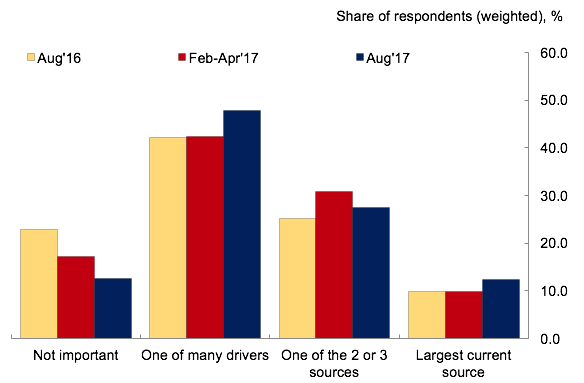 Brexit is a major source of uncertainty for firms. 2. 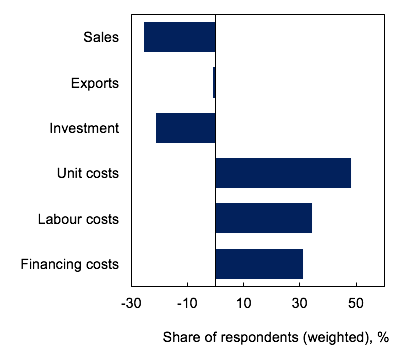 Most firms expect a negative impact of Brexit on sales, investment and costs. 3. 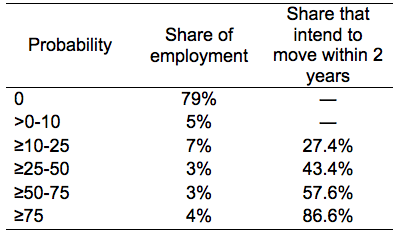 The majority of firms are not considering moving any operations abroad, but a few larger firms are. 4. Exit risks lowering aggregate productivity growth. 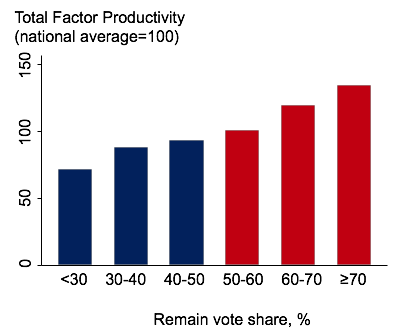 In contrast, the parts of the country that were in favour of Brexit had lower productivity (Figure 4), and have become more positive about future prospects since the vote (Figure 5), potentially raising investment and employment growth. If this leads to a reallocation of investment and employment from higher to lower productivity parts of the country it could reduce UK productivity growth. Authors' note: Principal Investigators Bloom and Mizen have received £683,636 in the form of an ESRC standard grant for “Measuring the Impact of Brexit on UK Investment, Productivity, Sales and Employment”. The funding will support an online survey and research into the impact of Brexit on the UK for three years, 1 Sept 2017 – 31 August 2020. The project is carried out with the collaboration of HM Treasury, Bank of England, the Universities of Nottingham (UK) and Stanford (US). Dhingra, S, H Huang, G Ottaviano, T Sampson, J Van Reenen (2016), “The consequences of Brexit for UK trade and living standards”, VoxEU.org, 4 April. Decision Maker Panel data: On 20 September 2017 the Bank of England published aggregate level results from the Decision Maker Panel survey of 2500+ businesses alongside its regular summary report of business conditions based on intelligence gathered by the Bank’s Agency network. See "Agents’ summary of business conditions 2017 Q3 and results from the Decision Maker Panel", available at http://www.bankofengland.co.uk/publications/Pages/agentssummary/default.aspx. Decision Maker Panel data will be published on a quarterly basis.